In a series of Tweets the chairman of News Corp, which owns The Times and The Sun, expressed a range of opinions on British politics, Scottish self-rule, and rising inequality in the UK and US. Murdoch, 84, suggested “dirty” deals would be made between the political parties after the general election if no party wins a clear majority. He also predicted Prime Minister David Cameron would be dropped by the Conservative Party if he failed to gain a majority against Labour leader Ed Miliband. He said this was “open talk” among Tories. The Australia-born press baron has been viewed as a kingmaker in British politics because of the influence he wields through his newspaper outlets. Murdoch’s tabloid the Sun had a weekly readership of 5.4 million in the UK last year. However his power took a blow in 2011 after revelations of illegal phone hacking by News Corp journalists became public. During the same year he testified before a Parliamentary Committee alongside his son, James Murdoch, who was previously a non-executive chair at British Sky Broadcasting (BSkyB) and who currently holds senior positions in his father’s business empire. The billionaire media tycoon shared his thoughts on the future of the UK and the upcoming general election through Twitter on Sunday. Murdoch has previously backed Alex Salmond, former leader of the Scottish National Party (SNP), praising him as a cunning politician. Scots may be crazy or not wanting self rule, but who can deny right of self determination? Feels inevitable over next few years. 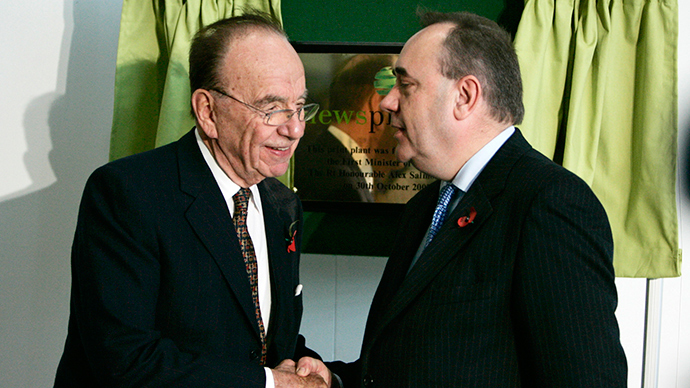 Salmond’s close ties with Murdoch were first revealed in 2012, when private documents were released detailing the extent of their relationship. Letters published shortly after Murdoch shut down his popular tabloid News of the World exposed how Salmond had more than two dozen meeting with Murdoch or his executives. The media mogul also commented on the likelihood of no political party wining the general election, a situation known as a hung parliament. UK. Polls all indicate hung parliament, possible constitutional crisis. Doubt the crisis bit. Deals, maybe dirty, will be done. Murdoch also indicated the SNP were “cleverly hurting Miliband” by hinting at their support of Labour in the election. Cameron’s future as leader of the Conservative Party is at stake in this election, Murdoch suggested. UK. Failure to win majority against either Brown in crisis or Miliband would mean chop for Cameron. Open talk today in party and press. In a surprise comment for a man estimated to be worth over $14 billion (US), Murdoch also weighed in on the Sunday Times 2015 Rich List, published on the weekend. S. Times shows rich almost doubled over last few years. Same in US. Why? Central bankers printing trillions, no real job creation. His claim that the economic turmoil gripping “advanced” economies has been caused by “regulations and power crazed lawyers” received a barrage of responses on Twitter. @rupertmurdoch Ay, it was all those regulations that forced the banks into crippling the economies, you mean? @rupertmurdoch "power crazed" hey? Pot calling the kettle black if I've ever seen it. Murdoch is rarely one to shy away from making controversial comments on Twitter.